Thanks to the rising demand for pharmaceutical products that are manufactured using aseptic technology, the market for blow fill seal (BFS) technology in Latin Africa has been displaying a substantial rise in its size and valuation. Over the forthcoming years, this market is expected to be greatly influenced by several market trends, such as the advent of co-extrusion and blow fill insert seal technologies. The leading players operating in this market are focusing aggressively on improvements in the production process in order to minimize the generation of non-viable particulate matter, which is likely to support the growth of this market substantially in the near future. The opportunity in this market is estimated to increase at a CAGR of 6.40% between 2016 and 2024, rising from US$205.5 mn in 2016 to a value of US$337.8 mn by the end of 2024. Polyethylene (PE), polypropylene (PP), and several other materials, such as ethylene vinyl alcohol (EVOH) are the key components required for the production of blow fill seal. With a share of 62.4%, the PE segment led this Latin American market in 2016 and is expected to continue to rise significantly over the next few years. Due to its low gas and water permeability, PE does not interfere with the drug. This factor is expected to fuel the growth of this segment in the years to come. Among all PE materials, LDPE is reporting a higher demand due to its excellent resistance to acid and bases and non reactivity at room temperature. HDPE is also projected to witness increased demand over the years to come, thanks to its high strength to density ratio, resulting in less spillage occurrences. The pharmaceuticals, food and beverages, and the cosmetics and personal care industries have emerged as the key end users of BFS technology in Latin America. The products available in the Latin America market for BFS technology is primarily utilized in the pharmaceutical industry, which acquired a demand share of 98.4% in 2015. Researchers expect this scenario to remain so over the next few years, thanks to the growing need for user-friendly and flexible container designs among consumers. Among others, the food and beverages industry is poised to be the next lucrative end-use segment for BFS product manufacturers in the near future. The rising demand for sports and nutritional drinks is anticipated to fuel the uptake of BFS technology in the food and beverages industry in this region. In terms of geography, the Latin America market for BFS technology reports its presence across Brazil, Argentina, Mexico, Venezuela, Colombia, and the Rest of Latin America. In 2016, Brazil held a share of nearly 43% in the overall market, registering its dominance. Researchers project this domestic market to remain on the top over the next few years, thanks to the significant rise in its pharmaceutical sector. Mexico, which stood second in the overall market in 2015, is also estimated to witness high growth in its BFS market in the coming years due to a relatively stable economy and the growing trade relations with the U.S.
Nephron Pharmaceuticals Corp., Weiler Engineering Inc., Horizon Pharmaceuticals Inc., Rommelag Kunststoff-Maschinen Vertriebsgesellschaft mbH, Unipharma LLC, Brevetti Angela S.R.L., Takeda Pharmaceuticals International AG, and Unither Pharmaceuticals are leading players in the Latin America BFS technology market. The Transparency Market Research report examines the Latin America BFS technology market for the forecast period 2016-2024. The primary objective of the report is to identify opportunities in the market and present updates as well as insights pertaining to various segments of the Latin America BFS technology market. The report begins with an overview of the Latin America BFS technology market, evaluating market performance in terms of revenue, followed by TMR’s analysis of key trends, drivers, and restraints witnessed in the Latin America market. Impact analysis of the key growth drivers and restraints based on the weighted average model is also included in the report. To compute the market size, in-depth secondary research is done. Data points such as regional splits and market split by material type, and end use has been assimilated to arrive at appropriate market estimates. The report comprises the forecast of the Latin America revenue generated by the sales of flexible packaging market. TMR triangulates the data via different analysis based on supply side, demand side as well as the dynamics of flexible packaging market. It not only conduct forecasts in terms of value, but also evaluate the market on the basis of essential parameters, such as Year-on-Year (Y-o-Y) growth. This helps providers to recognize the future opportunities as well predictability of the market. In order to understand and assess opportunities in the Latin America BFS technology market, the report is categorically divided into four key sections on the basis of product type, material type, end use and region. The report analyses the Latin America BFS technology market in terms of value (US$ Mn) and volume (Mn Units). Another vital feature of this report is the analysis of the BFS technology market by corresponding revenue forecast in terms of absolute dollar opportunity. This is traditionally overlooked while forecasting the market. However, absolute dollar opportunity is critical in assessing the level of opportunity that a provider can look to achieve as well as to identify potential resources from a sales perspective of the Latin America BFS technology market. To understand key segments in terms of their growth and performance in the BFS technology market, Transparency Market Research has developed a market attractiveness index. The resulting index should help providers identify existing market opportunities in the Latin America BFS technology market. 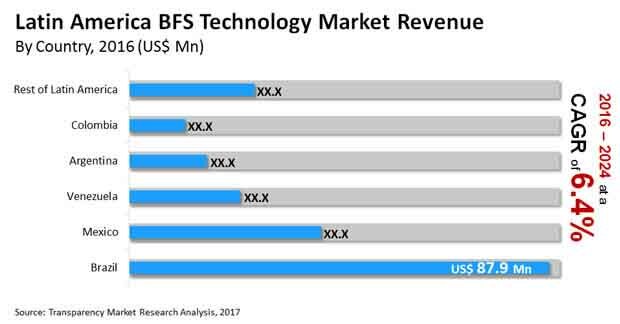 In the final section of the report, BFS technology market competitive landscape is included to provide a dashboard view of companies that manufacture and provide services of BFS technology market. The report contains company profiles of some of the key players in the Latin America BFS technology market. Some of the key players in LATIN AMERICA BFS technology market include Unither Pharmaceuticals, Takeda Pharmaceuticals International AG, Brevetti Angela S.R.L., Unipharma, LLC, Horizon Pharmaceuticals, Inc., Weiler Engineering Inc., Rommelag Kunststoff-Maschinen Vertriebsgesellschaft mbH, and Nephron Pharmaceuticals Corporation.